I know, you've been here before with articles on design and I'm willing to bet it's one of the subjects that's high on many turners' mental resistance list. So why don't I just skip this and find something simpler to write about, like how to daub paint on perfectly good wood, or perhaps...no, prudence says don't go there. Anyway, I've always maintained that there's always a simpler way to do anything - including writing about design, I suspect. Now lets see if I can add anything to such an esoteric subject, whilst also keeping it relevant to as many of the readers as is possible. The overall aim is to get 'design' seen as a natural, integral function of turning, and perhaps more importantly, encouraging turners to develop their own skills within this area. The word itself has many meanings and it can be many things: a single element like the curve of a bowl rim, or a combining of elements, parts or ideas to make up the design of a whole object. It could equally be a technical idea, or a design totally devoid of anything arty; many designs are coldly practicable, where functionality is all that exists. The point I am trying to make is that we are all involved, consciously or unconsciously, every single day in making design decisions; anything from what colour to paint the privy, to drafting plans for the next spaceship, or perhaps more relevantly, considering what to do with a lump of wood you have just purchased. In other words, 'design' or 'designing' is something we are all constantly involved in doing, or partaking in to a greater or lesser degree all of the time, whether we realise it or not. 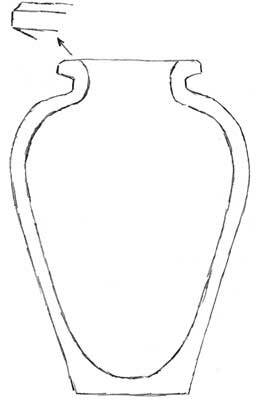 By way of a practical illustration, I've selected a well proportioned urn, complete with 'Pan' handles if you'll forgive the pun, to use as a basis for a turned vase. The choice was in no way intended to suggest it is an exemplary example of good design, but simply to provide an actual object that can be interpreted in wood. 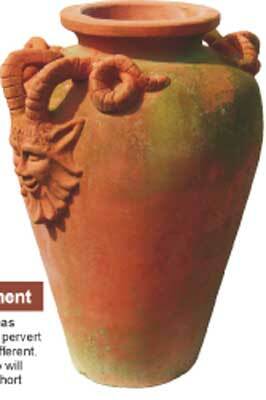 I would love to be skilled enough to incorporate the carvings of Pan in all his glory. The sketch in the gallery was based on the proportions taken from measurements using a piece of string and a tape measure. More on this later. 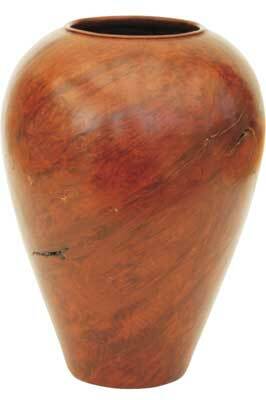 The wooden vase was also inspired by this form, but due to the nature of the particular piece of wood, it was felt prudent to 're-design it' on the fly and substitute a small raised rim. Good design must be seen as a fact, something that has rules or understood principles, but fashion can distort, pervert or even derail good design just for the sake of being different. This does not make design a fragile concept - it tends to will out in the long run, but it is often hostage to fashion's short term whims. So, whatever you do it basically comes down to personal likes or dislikes, and you don't need to be the product of an art college to produce good designs. In fact I would venture to suggest that formal art teaching has been the downfall of many potentially talented people, or artists. To support this I offer up an over-simplified, but nevertheless serious simile. Consider this, Canaletto in his day was an artist of some standing, but when fashions changed he was relegated by some to being a mere recorder of scenes, a big postcard maker for rich clients 'doing the grand tour.' How Grandma Moses, or LS Lowery, would have faired in those times I cannot even possibly imagine. Talking the talk is one thing, producing good designs is another. I think developing your own understanding of what works for you is much more important in building a design platform from which to do your own thing, and determining for yourself how involved, or otherwise, you would prefer to be. One way of approaching this is to identify the various elements relevant to a particular project in order to produce a satisfactory design. The following list is just by way of an example, and is based on a pepper mill. The questions and elements will vary from project to project. 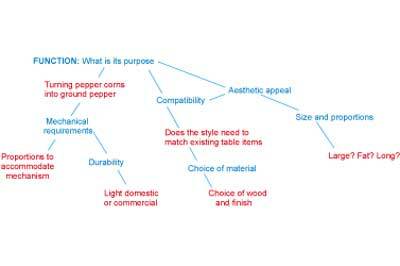 Such an analysis should help you to crystallise your thoughts as to what your design will be like, and by repeated use of the elemental approach it will strengthen your ability to visualise projects better. The French have an expression that might fit very well: arriere pensee - meaning 'behind thought.' And that is precisely where and what design is. What is the design motivation? Love at first sight - this is probably the reality behind most woodturning designs - you spot a piece of wood and buy it (emotions engaged, logic in idle) and then having arrived home with it, possibly smuggling it under your coat, comes the big question, 'what am I going to make from it?' Well, it's not a bad starting point and the purchase was the motivation. There are, of course, negative factors which don't normally get a mention in debates on designing, but have a relevant bearing on the process. Many years ago I wanted to take up woodturning but didn't get started for close on 11 years after I'd bought a lathe (no motor, no stand, well, nothing else really). I won't say that I couldn't, because if the motivation had been strong enough I would have found a way. Nevertheless I stayed in touch with my dream through spending odd moments doodling design ideas - mainly to ward off the risk of early managerial mind death. There's no magical bespoke definition for individual design motivation, all that can be reasonably stated is that you will fit somewhere between 'couldn't care less,' you just like shavings, to being completely immersed in a quest to produce more new designs. Having said that I'm sure many turners have some desire, but lack the confidence to get involved. It's a bit like the resistance one finds when trying to get a bowl turner to have a go between centres, where a little willingness to try, particularly in the skew chisel department, would soon overcome their reticence and open up a whole new aspect. So it is with design, and hopefully that is where we are heading. Well, the pair of fine Georgian candlesticks to be precise. An unlikely source, I agree, but the basis for an interesting design project for the dining table - especially as it would look odd if there was only one. They have books, but from what I understand they don't rank very highly in comparison with visits to supermarkets. You need to be selective and don't miss a visit to the dentists waiting room - they may have just the thing you are looking for. They provide an unparalleled treasury of good source material and ideas; the distillation of many styles are to be found in sculptures, ceramics and artefacts etc. Where else would you find such inspirations of form, proportion, texture and colour? A great learning ground. Here you will find many sites of interest - it's not, however a bastion of finely honed good taste. You'll need to make your own mind up and allow for the fact that some folk like turned objects that remind them of hideous deep ocean creatures. As for shop windows, television etc, I'm sure you've got the message - learn to look at everything with an eye to reading the designs, or design details. Well, almost everything, be wary of items sporting the 'designer label' thereby suggesting that a professional 'designer' of some standing had evolved the object. In reality, this is very unlikely. As I've just promoted museums, I suppose it would be timely to deal with design theories. In any human endeavour, albeit science, mathematics, or art, there are those who have had the vision, sometimes aided by luck, to make a significant breakthrough in their field. This is almost invariably followed by others' writing papers theorising as to why it works, and usually supported by invented formulae to prove it. Well, it's no different in design - when you've invented it there will be plenty of people around to tell how you did it. 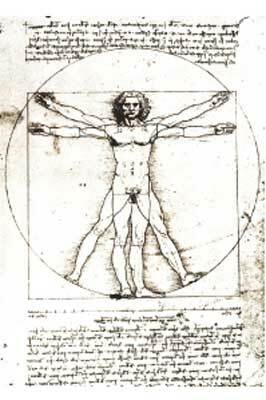 Rules for the scaling of proportions of an artefact go back as far as ancient Greece and many more later, including Leonardo DiVinci. His illustration here bears this out - even God didn't escape having the rule run over his efforts. This is a geometric rule, dreamt up in ancient times, which purports to establish harmonious proportions in the designing of an artefact (or architectural designs). Fig. 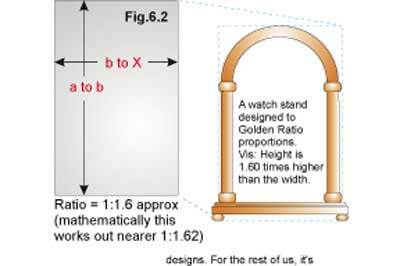 6 illustrates the basis of its creation by the division of a single line a-b at its mid-point, followed by a sequence of arcs to form the 'golden section' rectangles. Fig. 6.2 shows such a rectangle which would be used to establish 'building block' proportions in a design. I have included this as it will crop up from time to time if you research different design ideas. However, my view, for what it's worth, is that there is nothing wrong with using such a rule, but it will often be at odds with what you want to do, and I think it is more profitable to develop a sense of what are pleasing proportions to yourself, or to those of your customers. To summarise, proportions come naturally to some people and quite unconsciously they produce nicely balanced designs. For the rest of us, it's something we need to learn by trial and error. Never shy away from analysing your creations. It is like learning to use a skew chisel without the heart stopping moments, you need to revisit the design aspects of your previous works from time to time. If you don't feel it can be improved upon, you have achieved a satisfactory level or standard. The first job before attempting to sketch the urn was to take some key dimensions. As I don't own a bumper size set of callipers, I fell back on the use of string for the widest diameter, and for the base diameter. To do this, wrap string exactly one turn around the relevant diameters and remove without losing the actual length, and then determine the length with a tape measure. These are the circumferences of the diameters you need. Now for all of you who sat riveted to your stools in school maths lessons, you know that Pi (= 3.142) is about to return to your lives, and all you have to do is divide the circumferences by the value of Pi. So the sums are: widest circumference of 1602mm (63in) divided by 3.142 = 510 diameter. Base circumference of 754mm (29 1/2in) divided by 3.142 = 240mm diameter. 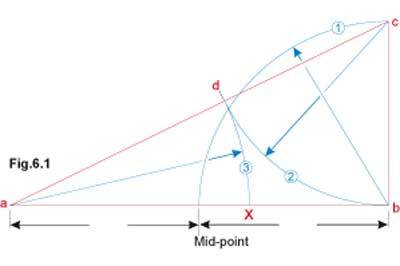 f) Draw node points of the key dimensions. 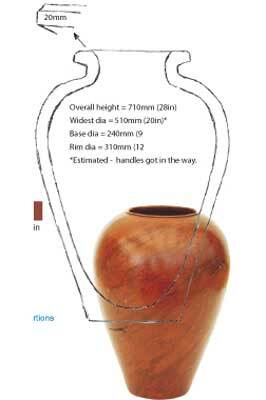 For ease of working you can set out half the horizontal dimensions, and then, using a pencil, sketch in half of the vase. The paper can then be carefully folded in half on the centre line (sketch to the inside). Next, rub the reverse surface of the sketched half and it will transfer a fainter mirror image onto the other side, which you can then easily over sketch for a more accurate full view. Fig. 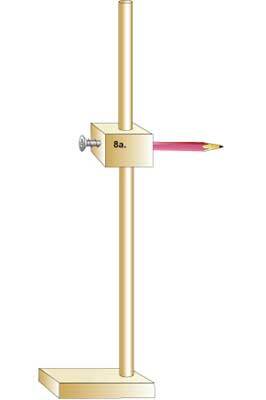 8a shows a self-made height marking device, consisting of a small wooden base, a length of dowelling and a small block accommodating a pencil and a screw (loosen enough to be finger tightened). If you are, or were, an engineer then perhaps you still have your scribing block which can perform in a similar way. 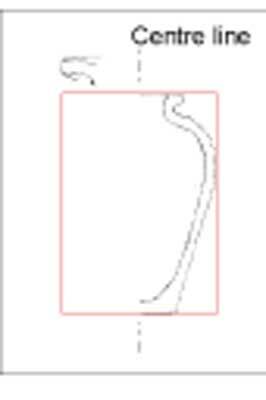 However, having a pencil instead of a plain point means the height of each reference point can be transposed to paper without having to measure each setting - as shown in Fig. 8b. Fig. 8c shows the transposed full outline (tinted for clarity). 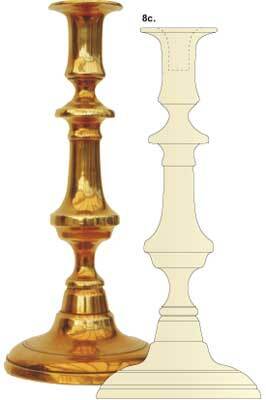 A full sketch can be produced along the lines suggested above, however, producing something like a pair of 'match turned' candlesticks calls for close attention - a poor match can't be hidden by the choice of wood, or a top class finish. Match turning calls for more than a little patience, and a determination to produce a worthwhile result, but if you do, it's an achievement to be proud of. So you've seen a shape, photograph, or simply visualised a design you'd like to turn. So what are your options to make a drawing of it? Whichever way such a drawing is made, it comes down to an image on paper - irrespective as to whether you arrive there via a computer using designing software or by using your hands. Certainly some highly skilled individuals can work up designs fairly effectively, but I fear that computers and their software, are greedy consumers of time, and impose too many constraints to make it the most satisfactory choice for most folk. I suspect it's the lure of being 'with it,' and possibly the impression that it will empower the user in some way with skills he or she does not think they have. Image size is also a problem, screen appearance and size is a limitation, as are the sizes of paper your printer can handle. I make this point because we all know that the size of an object has a strong bearing on what detail (beads, recesses, etc) is appropriate and indeed to some extent the size of the object influences the overall shape you have chosen. 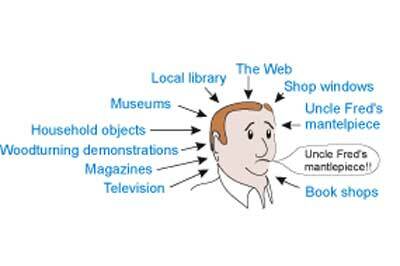 Moreover, computers add an extra layer of processing between the design concept in mind and its presentation on paper. Also having got a print out, making changes to a design is not a fluent act; itâ€™s another part of the interpretation process. Pushing a mouse about does little to improve hand-eye coordination, or manual dexterity, and hardly serves to develop your design skills. Also, most specialised woodturning software programs are not good at handling more than basic shapes - fine detail is not very practicable. but I would point out that whilst I'm an extensive user of high end graphic programs, I invariably work up a design by sketching it on paper as it is quicker and more fluid; only then do I transfer the sketch to the computer to polish it up for publication. A turner does not need polish for a working drawing. 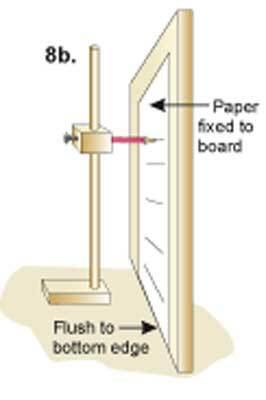 In this day and age advocating paper may seem somewhat archaic - failing to move with the times - but I can assure you that paper, used more or less directly, is by far the most practicable design medium and is directly compatible with the very skills a turner needs to develop to smoothly control and manipulate a variety of cutting tools. 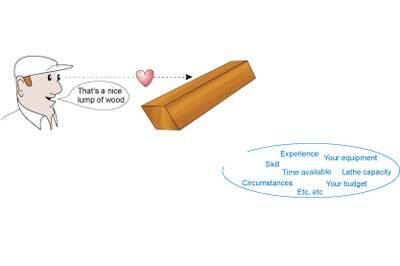 Therefore, these skills should transfer fairly naturally - look on it as simply another tool to master. 1.You may find that it is far easier to scale drawings in metric, even if you usually prefer to work in imperial.